1) Pocket--Multi-pocket,can hold more items. 2) Comfortable--Made of high quality cotton fabric,durable yet comfortable. 3) Collar--Unique Stand Collar,fashion and warm. 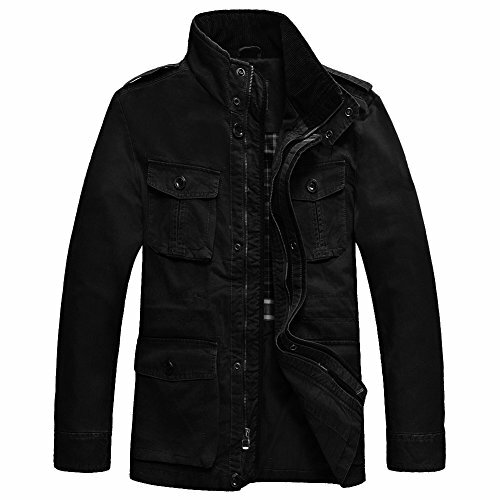 4) Metal--Zipper and Button use copper material,more durable. 1.Please check size note carefully before order.Should any doubts, please contact our customer service team directly for suggestions. 2.Product size guide information: North American size will be larger than Asian size - The Jacket tag size is Asian size. 3.Don't need to use the Amazon's US sizing chart, please see the picture on the left size chart. Fulfilment by amazon: The normal arrival time of Fulfilled by Amazon is between 1 and 3 days. Returns: amazon.com product return policy. Standard shipping service: need 10-12 days after send out by USPS. If you have any questions about this product by JYG, contact us by completing and submitting the form below. If you are looking for a specif part number, please include it with your message.